Prior to Sunday, 23 July 2017, only a handful of cricketers from the finalists could say they had previously played at Lord’s. Come the end of that enthralling day, all 22 – whether delighted English heroes or despairing Indian stars – were able to tell the tale of a truly momentous occasion. More than 25,000 were at Lord’s to watch a spirited England come back from behind to secure its fourth ICC Women’s World Cup, defeating India which lost its last seven wickets for 28 runs to go down by nine runs. With flags, clappers and instruments alike occupying the stands, there was a party atmosphere in store for the ideal celebration to end an enthralling tournament – with a frantic finish to boot. Queues stretched all the way down St John’s Wood Road from the ground, and with a plethora of girls making up the crowd, the next generation of players could well have been sitting in the stands on Sunday – just as Anya Shrubsole was 16 years ago. As if it needed it, the game also had an extra edge when it came to the contest. England had won seven straight consecutive games to reach the final, and with India the only side to have beaten it on the opening weekend, thoughts of some may have been back to a month previous. And what a month it has been. From the very first day records were broken as Mithali Raj became the first player to score seven successive half-centuries, while New Zealand opened its competition with a Holly Huddleston five-for and Suzie Bates 100 against Sri Lanka. 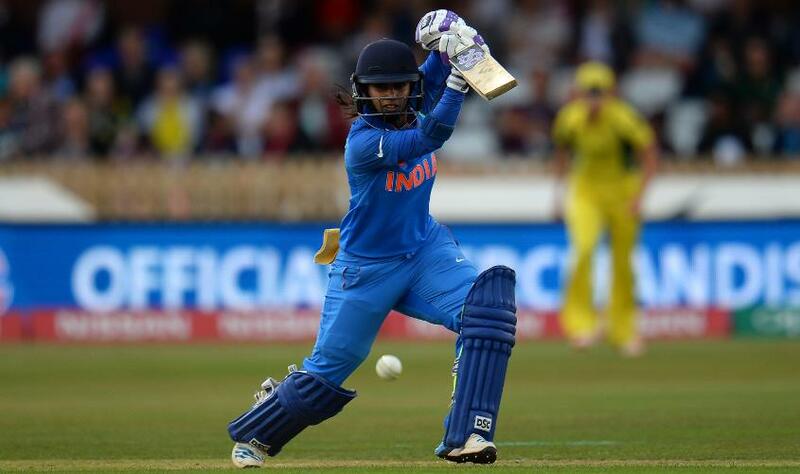 Mithali Raj became the first female cricketer to scale 6,000 runs in ODIs and also reached a record seven consecutive half-centuries during the tournament. From there on, milestones fell like confetti, as no fewer than eight players completed a century of ODI appearances, including the first South Africa player in Mignon du Preez. Ashleigh Gardner became the first Indigenous Australian woman to play in a World Cup, while teams made record world cup scores in a competition with just one out of 31 matches lost to rain. Then there were further individual heroics, as Chamari Athapaththu bludgeoned a tournament high 178 not out for Sri Lanka before South Africa tasted success through Dane van Niekerk, who became the first bowler in international cricket to take four wickets without conceding a run. The South Africa captain’s 15 wickets were the most in the competition, while England’s Tammy Beaumont finished as the top run-scorer with 410 – just one ahead of Raj. But for Raj, more was to come. She became the leading run-scorer in women’s ODIs, passing the previous record of 5,992 runs set by Charlotte Edwards, and before becoming the first complete 6,000 runs. Meanwhile, Beaumont also joined Sarah Taylor in a world cup record partnership, while runs flowed for Deandra Dottin, who made her maiden ODI century and West Indies’ fastest in World Cups, against Pakistan. Pakistan’s Sana Mir was not without its own achievement, as she too reached 100 ODI caps with a well scored half-century. But the most impressive fact of them all? All the above were completed before the group stage had reached its conclusion. There was no shortage of drama in the knockouts either, as Shrubsole – who else? – squeezed a four through the off-side to help England battle past South Africa in Bristol, the same ground where it had its Ashes thriller against Australia. And that’s the path that took us to Lord’s – a cacophony of high-action drama in 31 games across 30 days, before the cacophony of noise rounded it off in some style, with a final that will be remembered for many years to come.